What is a freak cake? A cake that’s all about crazy toppings! 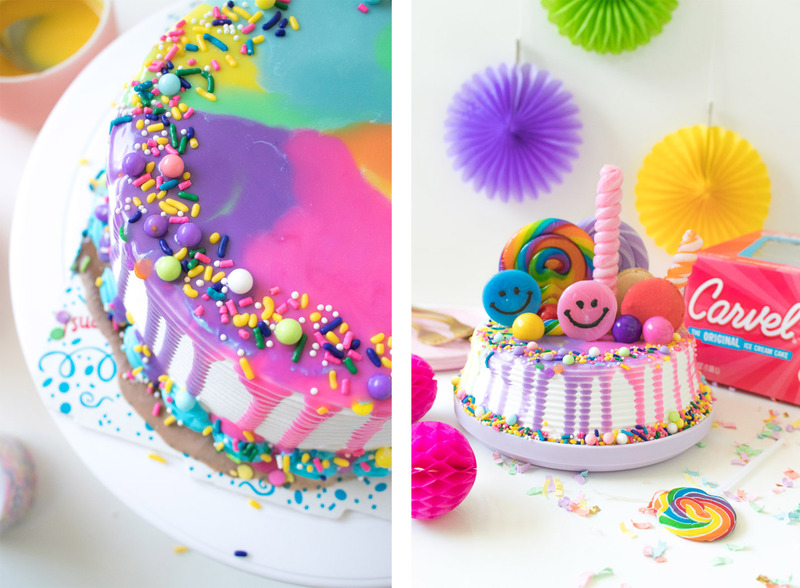 Use a round Carvel Ice Cream Cake as the base for this rainbow freak cake, glazed with a rainbow white chocolate drip and a variety of colorful candy toppings. They look almost too pretty to cut into, but with a storebought ice cream cake, it’s not much work to turn it into a glorious rainbow freak cake! Follow this easy step-by-step from Club Crafted. No matter what you’re celebrating this week (like a Tuesday), this over-the-top rainbow freak cake ice cream cake will be the highlight of the day. – Rainbow or colorful lollipops, candy, cookies, etc. Use a spatula to smooth out the top frosting. 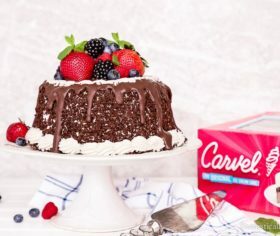 As pretty as it is, we can’t add that signature freak cake drip unless it’s flat. Move back to the freezer while you make the ganache. To make the ganache, you’ll use equal parts cream and chocolate. Heat the cream in the microwave for about 45 seconds until warm. Mix in white chocolate and heat in 30-second intervals until you can mix them together smoothly. Once the chocolate has completely melted into the cream, pour the ganache into multiple small bowls. In 5-6 bowls, stir food coloring into the ganache so you have a bowl for each color of your rainbow. Allow ganache to cool, which will also allow it to thicken. Remove the cake from the freezer. 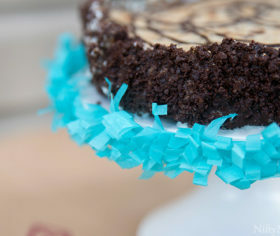 Use a spoon to carefully push small amounts ganache over the edge of the cake and create the drip. Alternate colors either randomly or in a rainbow pattern. Then add ganache to the top and allow the colors to blend together like tie dye. Immediately sprinkle the edges with rainbow sprinkles. Move the cake back to the freezer to set. If using lollipops for toppings, cut the sticks so that they will fit entirely into the cake. Once the cake is properly frozen and the ganache has set (it may continue to drip in the freezer), remove it and stick lollipops into the cake. Note the front of the cake and place larger pieces at the back and smaller pieces toward the front. Fill in with other colorful candies, sprinkles or cookies. Due to the size of my serving plate, I also filled in the bottom of the cake with extra sprinkles. 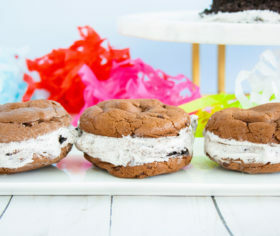 Move the cake to a serving platter or stand if desired and cut immediately to reveal the tasty layers of chocolate and vanilla ice cream with a crunchy center inside! This is the easiest ganache recipe ever with only two equal-part ingredients, so it’s easy to whip up and drip over your cake. The rest is just throwing the rainbow kitchen sink all over the cake, ha! Check the candy aisle of your grocery store or a party store for colorful candies to decorate the top, or even leave that pretty tie dye rainbow drip to speak for itself. Add a cake topper or candles for special occasions, and this cake is truly a treat for every type of celebration. Remember, the most important thing about decorating an ice cream cake is making sure it stays frozen! Move it back to the freezer as needed to prevent melting.